Some dogs live well-fed and sheltered middle-class lives, while a lot fewer live in the hedge-fund luxury of New York. Fewer still–well, six actually–live a life that only a successful 45-year career in the world of haute couture could provide. I’m talking about the magnificently coddled lives of Milton, Monty, Maude, Margot, Maggie, and Molly, six pugs belonging to supremely well-dressed Italian Valentino Garavani. Valentino, world-famous haute couture designer and seriously tanned and active octogenarian, basically worked his hump off for almost half a century. The result, a personal fortune containing many, many zeros, enables him to go well beyond what anyone would consider living well. His beloved pets also take “living high on the hog” to an extreme, even if they are pugs and only weigh about 15 lb each. MW and I learned all of this by watching the 2009 documentary Valentino: The Last Emperor. In contrast to the gaudy ugliness with which so many arrivistes like Donald Trump gild their lives, Valentino envelopes his life with long-legged sophistication, natural fibers and the aforementioned pugs. 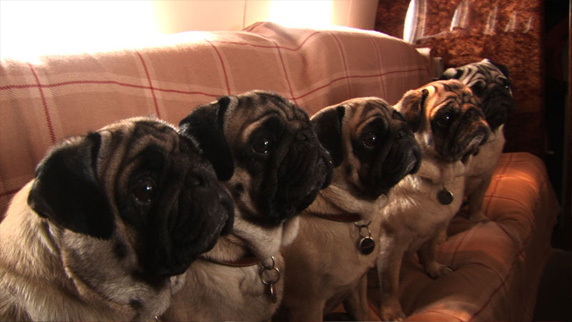 The pugs accompany him everywhere. I really mean everywhere; from his 14-passenger Challenger jet, automobile fleet and country properties, to his urban apartments and Swiss ski chalet. Whither the master goes, the dutiful pugs follow happily at his heels. It’s a good thing the maestro fell in love with pugs because his fashion trajectory, during which he’s clothed decades of beauties from Jackie O. to J-Lo, would have been a hell of lot lower if he’d fallen for Great Danes. Valentino made his career and renown by transforming silk chiffon and other delicate fabrics into dreams that shone from the cover of Vogue. Pugs are so low to the ground, the only thing they can slobber on is a model’s heel. Great Danes, on the other hand, drip from a pretty altitude. I’m pretty sure Vogue wouldn’t have run the pics had mid-thigh saliva stains nestled among the taffeta swirls. One of Valentino’s evening gown design fundamentals is that ankles don’t show beneath a dress hem. You can hear him express this in the film when a 5’11” model with what appears to be a 54” inseam sashays in one of his designs. Drop five adult 32”-37” high Great Danes in Valentino’s atelier and he never would have even been able to see his model’s thighs. Who knows what might have happened had he offered calf-length or knee-high evening gowns? Sarah Jessica Parker might have walked out of that season’s runway show. Anna Wintour might have become imperious. They’re not the world’s worst hair shedders but Great Danes start losing their hair regularly once they reach six-months of age. For the remainder of their lives, they will drop thousands of inch long strands on your floors, furniture, Chanel suits and wool pants. This is what Valentino avoided, the stress of continual fabric cleaning, not to the mention the cost of lint brushes. And judging from the film, fashion is an industry that’s stressful even for hecto-millionaires and demi-billionaires. Like Queen Elizabeth 2 who opted for corgis, Valentino clearly made the right choice when he fell for pugs.